armitagesangel has posted a set of name gifs of chaRActers. Here’s Standring, and this is Guy of Gisborne. Check her blog for more. A short list this week. I probably have missed a lot of stuff, but then there was also a lot of stuff relating to ITS and Cinemacon which were well-documented on blogs, so I didn’t see any point in including them here. Let’s see what the creative community will come up with next week, now that we have plenty of new material available from the Cinemacon event. Have a great weekend, everybody, and sorry for the snafu. Thanks, Guylty. I loved modern Thorin as soon as I caught sight of it a few days ago, so I’m happy to see it included here. Hoping for more Lego RA characters- Porter would make an excellent addition to the collection, I feel. Oh dear oh dear – I had forgotten to finalise the weekly round-up. Oooooops. Got carried away watching Ashes to Ashes on Netflix last night, and my duties slipped my mind… Better tidy that up now…. Thanks for the list! Modern Thorin – wouldn’t mind walking into him in the street…. Silver fox – the future looks great..! And triple’s giveaway is definitely worth checking out, if that’s your kind of thing. Yeah, RA is definitely a case of a man getting more and more attractive as he ages. At the same time, I must say he is looking much younger now than this time last year. Good for him. Well rested and under less pressure. 🙂 And definitely aging like fine wine..
Hehe, has the weekly round-up become a part of your Saturday morning routine? That would be great, actually 😉 I am glad if I can make anyone gasp – sort of second-hand, of course, the credit goes to the creative people behind the links. Thanks Guylty. Love Giz’s manip. I”m thinking some of this is what caused the Muse to begin to stir. Actually the Muse was quiet for me, but now, oh yes he is beginning to stir. Strange things tho are coming out of my ‘pen’… not sure any of it is usable. The Thorin in a suit one? Yeow. Great round up, as always! Modern Thorin. Please give me a boss like this and I stay in the office 24 hours a day without even asking to be paid more !!!!!! LOL – well, give me Thorin as a prison guard and I’ll give myself up, no problem 😀 I’ll let him tie me up without putting up a fight. Random Richard Armitage trivia re: Ashes to Ashes — he said something once about Keeley Hawes in Ashes to Ashes looking the way girls looked when he was just discovering them. 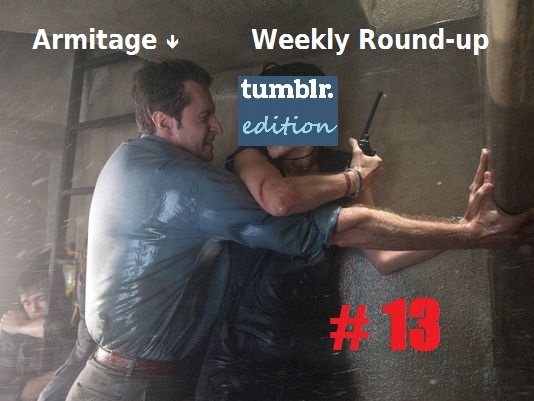 Off to read the roundup now!